Staff can control logistics processes from mobile devices such as smartphones and tablets and use virtual reality applications to plan future logistics. Staff can control logistics processes from smart devices. Smart Transport Robot at BMW Group Plant Regensburg. Autonomous transport systems outdoors: AutoTrailer manoeuvres truck trailers. 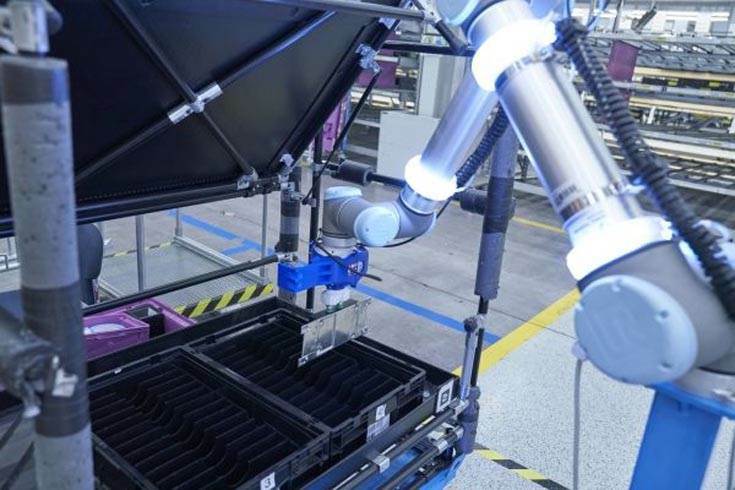 Logistics robot ‘PickBot’ at BMW Group Logistics. The electric truck loading new vehicles at BMW Group Plant Munich. The BMW Group is increasingly relying on innovations from the fields of digitalisation and Industry 4.0 in production logistics. This will ensure the company’s global production network continues to receive the parts it needs in a timely and reliable manner in the future. The BMW Group has a global network of 3,200 suppliers at 4,500 production locations in around 50 countries and every day BMW Group vehicle plants worldwide take delivery of more than 31 million parts! Digitalisation and innovations help the company organise logistics more flexibly and more efficiently. At the same time, almost 10,000 vehicles coming off the production line daily must be delivered to customers around the globe. Digitally connected delivery, so-called Connected Distribution, ensures that these transport routes are also more transparent. The carmaker’s focus is now on applications such as logistics robots, autonomous transport systems at plants and digitalisation projects for an end-to-end supply chain. Staff can control logistics processes from mobile devices such as smartphones and tablets and use virtual reality applications to plan future logistics. Innovations coming out of many pilot projects are being implemented worldwide in logistics at BMW Group plants. The BMW Group’s supply chain relies on a global supply network and close cooperation with numerous logistics service providers. The Connected Supply Chain (CSC) programme significantly increases supply chain transparency. It updates the plants’ material controllers and logistics specialists on the goods’ location and delivery time every 15 minutes. This transparency enables them to respond immediately if delays appear likely and take appropriate steps early to avoid costly extra runs. Autonomous transport systems such as tugger trains or Smart Transport Robots are increasingly used to transport goods within production halls. To allow tugger trains to now also be used for the sophisticated process of supplying assembly lines, as part of a pilot project, BMW Group Plant Dingolfing has developed an automation kit, which enables conventional tugger trains of any brand already on hand to be upgraded to autonomous tugger trains. The capabilities of these driverless tugger trains go beyond automation of earlier solutions. Another future technology is also being piloted alongside autonomous tugger trains at the Dingolfing plant. A Smart Watch supports logistics staff during the container change process and announces approaching tugger trains via a vibration alarm. The employee can also read which containers should be unloaded and send the tugger train on to its next destination by tapping the display. The BMW Group is also pioneering the use of autonomous transport systems outdoors. As part of a pilot project, the BMW Group is using an autonomous outdoor transport robot for the first time at its Leipzig plant to bring truck trailers from where they are parked to the unloading and loading bay on their own. A mobile platform drives underneath the trailer, connects it and steers it through the plant. 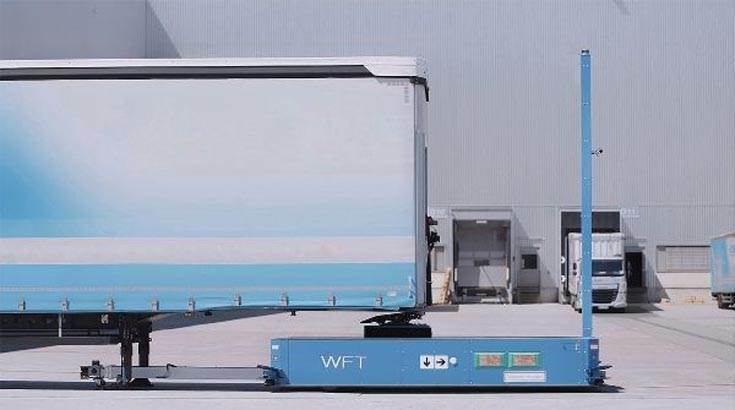 The so-called AutoTrailer, with a payload of up to 30 tons, navigates by laser, without additional guidelines or markings, through the plant’s outdoor areas. Sensors and cameras provide a 360° all-round view, which forms the basis of the safety concept. The huge potential of this transport system is particularly evident at the BMW Group’s largest plant in Spartanburg, where about 1,200 of these trailer-shunting manoeuvres take place every day. Back in 2015, the BMW Group joined forces with the Fraunhofer Institute IML to develop the first self-driving Smart Transport Robots (STR) for transporting roll containers through logistics areas within production halls. The second generation is now in operation at BMW Group Plant Regensburg. The flat robots carry roll containers weighing up to one ton and transport them autonomously to where the goods need to be. They calculate the ideal route independently and move freely through space. A built-in battery module from the BMW i3 powers the STR for a whole work shift. After delivery to the plant, the goods are transported to the assembly line in containers and parts containers of various sizes. For the tiring job of reloading containers from pallets onto conveyor belts or into storage, employees will be assisted in the future by logistics robots specially developed for this purpose. Four different types of robots, referred to as ‘Bots’ by logistics experts, are currently being tested or have already been integrated into series production. The lightweight robots take on different jobs: they can take full plastic boxes from the pallet in the incoming goods area and place them on a conveyor system, they do unload tugger trains and place boxes loaded with goods on a shelf, they collect various small parts from appropriate supply racks and they stack empty containers on pallets before they re-enter circulation. Using artificial intelligence, the robots can detect and process various different containers and determine the ideal grip point. 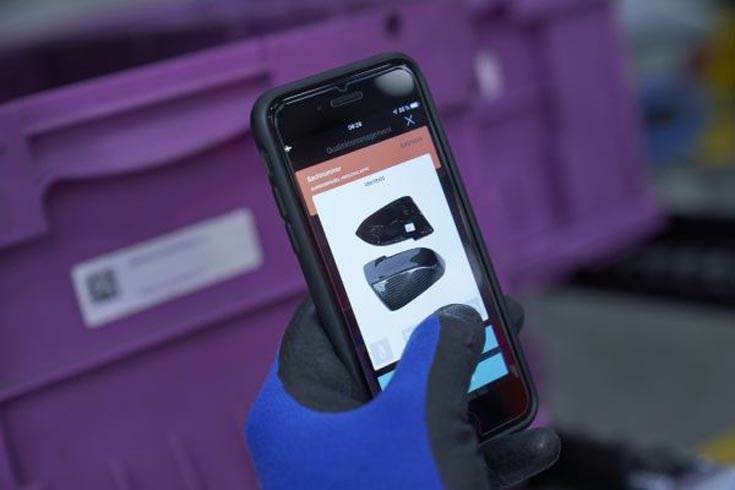 Gloves with integrated scanners and displays, data glasses and smart watches are increasingly used to support logistics employees. The transition to paperless logistics, with digitally labelled containers and shelves, opens up new areas of application for mobile devices. Glove scanners read the electronic label and indicate the exact contents of the small load carrier on a small display that can be worn on the arm. 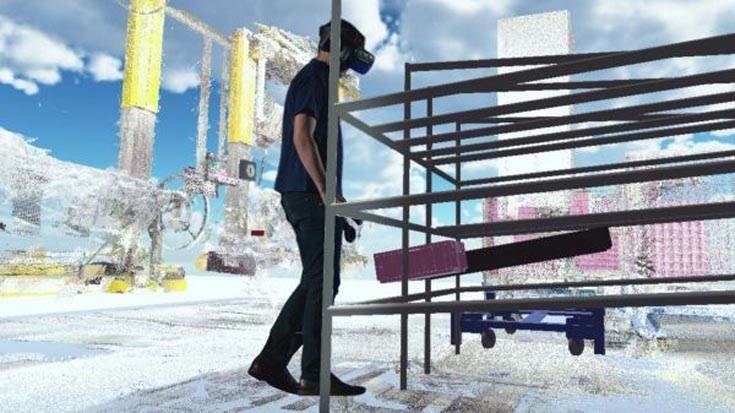 The use of virtual reality already plays an important role in planning logistics spaces. In a virtual environment, planners can quickly and efficiently lay out future logistics areas completely and assess how much space is needed, for instance. Planning is based on 3D data representing the real structures of a logistics hall. For the past several years, the BMW Group has been capturing its plants in digital form with millimetre accuracy, using special 3D scanners and high-resolution cameras. This creates a three-dimensional image of the structures, so that manual recording on site is no longer needed. When planning future logistics areas, BMW Group experts can now combine existing data with a virtual "library" of shelves, lattice boxes, small load carriers and around 50 other widely-used operating resources. Like delivery of parts to plants, the transport of vehicles to the dealership is now also digitally and transparently traceable. The former Connected Distribution pilot project was fully integrated into series production this year. The system uses the same IT built into BMW Group vehicles to track the location of finished vehicles once they are ready to leave the plant. The vehicle transmits its current geolocation and status to the logistics centre via a mobile connection every time it is switched off.